- The MCP200CS is a resettable manual call point for conventional fire control panels. - Easy to use and install, it complies with the EN 54-11standard. - The MCP200CS has a large activation surface that gives a visual indication after use. - An alarm status alert is completed by the illumination of the red LED indicator. Being one of the reputed organizations in the market, we are engaged in providing an exclusive range of Manual Call Point. We are a unique name in the market to provide our honourable customers an exclusive range of Manual Call Point. A V B Technologies Pvt. Ltd.
Manual Call Point System, we also take the Annual Maintenance Contract AMC. A fire alarm system is number of devices working together to detect and alert people through visual and audio appliances when smoke / fire is present. These alarms may be activated from smoke detectors & heat detectors, which are automatic or from a manual fire alarm switch which is generally called MCP. Owning to the years of experience we are engaged in manufacturing and supplying high grade manual call points. We use the high grade of raw materials to manufacture these machines so that our final products will be durable and strong. These products get automatically activated when any person press keys or pulls down handles. 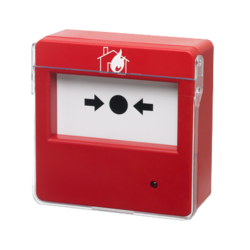 We offer high quality manual call points specially designed to allow building occupants to signal that a fire or other emergency exists within the buildings. 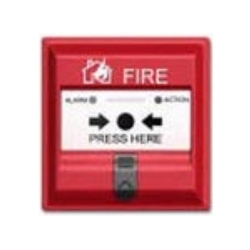 Being a well-distinguished company in the market, we are into offering Manual Fire Alarm Point.